Too often someone with hoarding issues will add pets to their “collections” and those pets end up being neglected along with the property. Recently, the Humane Society of Westmoreland County was called into help remove animals from a Murrysville Home. After two weeks of trapping cats, they were able to bring out a half-dozen Bengal-lynx mixes and put them up for adoption. The owner was forced to move into a nursing home and asked a neighbor to check in on the pets. The neighbor took one look at the hoarding situation and called in the Humane Society for help. People who have been clinically diagnosed as a hoarder are incapable of throwing out anything. They need counseling to get at the root cause before they can toss out the rubbish. Thankfully, a company like Junk King Pittsburgh is standing by to lend a hand when the trash needs to be carted away. For those big hoarder cleanups, Junk King will often dispatch multiple moving crews and several trucks to get everything cleared in a single day. That is certainly welcome relieve for the homeowners and the neighbors. Just because you have a lot of clutter doesn’t mean you’re a hoarder. It could mean you just need help. Junk King Pittsburgh can provide that help and all you have to do is designate what you want taken away. The crews from Junk King will pick everything up right on the spot. That means anything regardless of weight or size can be safely taken from your home. Just imagine what a difference that can make in your basement or garage? The junk clearing work provided by Junk King isn’t limited to the inside of your home. You could have a lot of things piled up on the outside of your home that could be removed. These could be things that are rusty or rotting. All the more reason to have Junk King haul them away today. If you need to take time to sort through your stuff, then book your appointment for Junk King on the weekend. On the other hand, if you’re ready to go, Junk King might even be able to swing by today to pick up your rubbish. You don’t have to surround yourself with clutter and rubbish. 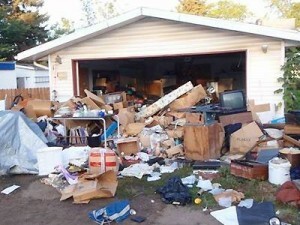 To get that cleared out of your Murrysville home, just turn the job over to Junk King Pittsburgh. This entry was posted in Pittsburgh Junk Removal and tagged hoarder cleanup, Junk King, murrysville on April 22, 2018 by Junk King. Last updated April 22, 2018 . Make Room for Presents In your Pittsburgh Home – Clear the Clutter! Get Green For St. Patrick’s Day in Pittsburgh – Recycle Junk!